NO INDEX ON LEFT SIDE OF SCREEN? Patented local area network system, including repeaters, fibre optic links, isolators, etc. for BMB CompuScience Canada Ltd. Provided primary manufacturing of these products for a number of years. Device using custom IC which provides memory mapping ('386 like) for 80286 processors. (Winner of PC magazine award for technical excellence). Using a number of ASICs, for All Computers Inc. Toronto. In addition, we also did preliminary development work on 386 and 486 to 286, plus 486 to 386 adapters modules. Custom printer Fonts for APL listing on dot matrix printer. This product was produced and sold by Agnew to various resellers. IEEE bus buffered interface for Epson printer. Interface provided additional printer functions and selection of alternative font functions. This product was produced and sold by Agnew to various resellers. A telephone call monitoring and cost management system. 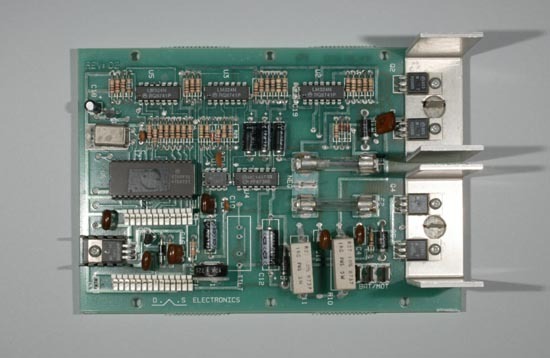 This device consisted of a custom designed circuit board which mounts in a PC. Each of these cards contained it own local processor and provided interface for 4 telephone lines. The system required that all out going call include user account numbers and was capable of redirecting the call to alternative least cost routing systems. The system would record details of both income and outgoing calls. The combination of the hardware and PC software therefore provide total telephone management and accounting for users such as lawyers, and other professional requiring telephone accounting. This project was done for Matrix Electronics Ltd., C-Drex div., Mississauga. An income call restriction device for home use. The device would pickup incoming calls and play greeting message. If caller entered proper ID code, the device would cause the telephones within the Home to ring. Failing that, it would transfer calls to a local answering machine without disturbing residents. This design was done for Ocean-Ox International, a Toronto based consumer products marketing Corp.
A digital tape control system for Broadcast News, Toronto. Broadcast News provides radio stations across Canada with capsulated voice based new reports. Their original system used direct land line distribution to the various radio stations. By selective use of such lines, the product could be selectively distributed by region (ie. English vs French, east cost vs. west cost). During the change to satellite link, a management over sight resulted in the system having no method to control distribution. That is, all radio stations received all languages and regional packages. AAE was hired to provide a solution, that could be operational within 6 weeks across the country. The client required a solution that could start and stop the radio station tape recorder units selectively for each news package. We designed and constructed 75 controller units within the required time frame. The device consisted of a microprocessor, modem , audio switching , and multi-function tape control interface. The central news system now transmits a digital preamble with each news package. Each radio station has a number of ID keys. If there is a match with the pre-amble, the tape unit records the package. We also designed and provided 15 encoder devices to provide automatic insertion of the preamble. Agnew produced a number of additional batches of these controller units as new subscribers came on line. For Broadcast News' sister operation, The Canadian Press (wire service). Agnew designed and produced a special rack mounted "PC" like data processor for special applications. 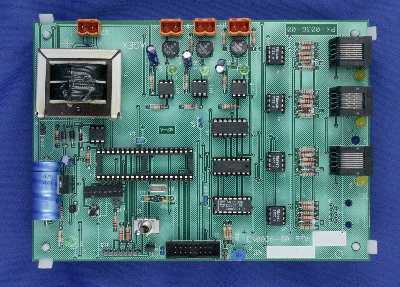 The unit consisted of an 8088 based processor system, serial/parallel interfaces, LCD display, processor active monitor etc. The client uses these units with their own software for such task as reformatting stock exchange data and other wire service tasks. A high performance miniature locator/pager radio system operating at 900 MHz. system. This development project is funded by the National Research Council of Canada as a research project for Gemstar Communications of Oakville. Agnew acted as the project engineer and primary engineering contractor. The system is a locally or remotely triggerable intelligent locator system operation in the pager/cellular phone band. The system is composed of a miniature battery powered receiver/transmitter controlled by an internal microprocessor and either operates with standard cellular phone services, or its own local microcell and directional locating systems. The unit can be used for tasks such as paging with message acknowledgment, to such tasks as using a microcell system and these devices to locate people/items in a plant, on the road etc. Agnew was responsible for the design of both the microprocessor system, as well as the state of the art radio system. An flexible 900 MHz. transmitter tag designed to be inserted in a standard letter envelope. This device developed for Gemstar Communications is used for monitoring traffic flow in letter sorting stations. A RF linked Time Domain Multi encoded RF field generator system. This system is composed of many slaved short range transmitter devices that create local encoded RF fields, each occurring in specific time slots that are used by Canada Post for determination of a tracking tags location within a postal plant. Redesign of a 900 MHz. short haul transceiver RF system used for remote utility meter monitoring. For Nexsys Commtech International of Waterloo. Remote controllable, battery operated golf caddy controller for Lectronic Kaddy. The unit is composed of a microprocessor and two variable speed DC motor drive controls. The user interface includes a handle mounted keyboard for setting speed, time limits etc, as well as an interface to a radio control. The Kaddy is self propelled, powered by its rechargeable battery and reduces the effort required to move the golf bag/cart around on a golf course. The remote control mode can be driven like a remote control model car with belt mounted controller. A time limiter and radio link checking system insures against run away. Various telephone call restriction units were designed and programs written for Control Access Engineering of Milton, Ont. These devices with various integrated software would restrict outgoing call to limited numbers, block long distant and other toll charges, but permit call to allowed numbers, and could be activated/deactivated by programable pass word codes. Smoke detectors for Broan Industries, Mississauga. Design work included development of a number of low cost DC and AC power smoke detector circuits. Given the nature and costs of the products, major efforts were involved in cost reductions. Agnew designed and manufactured a number of computer based controller for carnival and arcade games, including coin receiver, ticket dispenser, stepping motor control etc. The customer (Dobco Enterprises of Brampton) manufactures and distributes games for both use in booths as fairs and such, as well as coin operated games located at various tourist attractions. The design and development of a hand held battery powered computer using ROM program/data cartridges for Altimus development Corp, Toronto. The unit (under current development) uses standard Windows based software packages, with a custom Windows like interface to permit operation without a full keyboard, and smaller screen size. The specific applications for the product are proprietary at this time. The design includes a Intel embedded processor and a number of high density surface mount components to keep size down. Due to battery operation, extensive work was also required for the high efficiency switching power supply system. High voltage power supplies for electrostatic air cleaners, ElectroAir Canada. These included both small lower power 12 volt driven units for cars, to supplies for central furnace mounted air cleaners. A Personal Alarm device of the intense noise type, hand held. An automatic swimming pool disinfectant system based on metal ion (copper) release into the water. 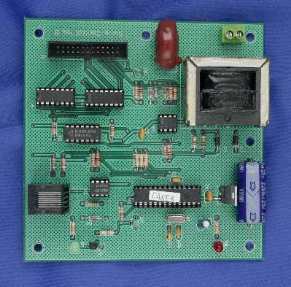 The unit involved a controller current source, polarity reversal controls, and timer system. The electronic controller is connected to copper plates located in the water flow of the filter system. The release of copper ion reduces the need for high chlorine or other oxidizer levels. This product was design and manufactured for Watertrol system of Mississauga. An Automatic swimming pool disinfectant dispenser control for liquid oxidizers. The unit controls the release of liquid pool chlorine. Designed for Blue Ocean Pools, Wainfleet, Ont. A computer controller, radio linked water leak detection/alarm system. Unit detects leakage using either hard wired or radio remote water detectors. It responds by activating a water valve to terminate water source to home. For Sima Inc.
A timing device for control if InfraRed controlled devices. Units provides timing functions and controls devices by learning their IR control sequences. Therapeutic laser systems both Gas and solid state for Mid-Canada Medical of Mississauga. The laser units where designed to the functional requirement of Mid-Canada medical. The units either used gas laser with a fibre optical delivery system, or solid state laser mounted in a probe. The laser intensity, pulse repetition rate, pulse rate, and total exposure time is computer controller. The units also included a calibrated intensity verification cell, and skin conductivity (electrical) measuring system. The various laser model included both battery and power line operated units, limited to approximately 30 mW. of power. Listening therapy systems, for MDS Health Care Group, Toronto. This is still an ongoing project, which was started in Canada in the early 1980's by MDS by their allocation with Dr. Tomatis of Paris, France. Edward Agnew has been since that time the primary Hardware resource person for the North American market (and includes Mexico and part of Central America). The Tomatis method involves correction of listening disorders (as opposed to hearing) by electronic signal processing unit to retrain the auditory system. The primary electronic device is a device call an "Electronic Ear" which filter and modifies the sounds such as music or voice in a controlled and programable manner such that it retrains the brains listening reflexes. Agnew manufactured hundreds of such units which are in service through out the world. In addition, we design and manufactured automatic listening test units (computer controlled special function audiometers), audio signal filter units, automatic signal level controls, and signal frequency density intensifier units ( device with uses multiple shifts in frequency and time to create effect of a more sources, such as a chorus from a single voice). Redesign of Electronic Ear device into a ultra compact shirt pocket sized device for home treatment use. Unit makes use of the latest in SMT packaging as well as advanced IC's to create the same functions as the table top unit in a very small battery powered unit. High speed computer controlled autoclave unit for SciCan of Toronto. Agnew designed the computer control circuits, and jointed developed with SciCan's engineers the various other interface, sensors and control systems. The unit is an ultra fast small autoclave unit for dental and small surgical use. It uses a very small boiler chamber, high pressure water injector pump and very tight computer control to minimize the time required to perform the required disinfecting cycle. Culture growth incubator with programable magnetic coupled stirring system and critical temperature maintenance, for RevTech of London Ont. This incubator included battery backup of both heater and stirring system, as well as logging of actual temperature profiles. Agnew designed and manufactured the electronic components. High speed pharmaceutical capsule fill level sorting system using a RF based non-contact measuring system. The design work was for Sherman Technology Inc. of Toronto. Agnew worked with the client's mechanical designers to develop the prototype sorting system. The basic unit operated on the principle of firing a capsule through a tube containing a set of electrical plates. The amount of material within the capsule determines the electrical capacitance between the two plates. The computer control system compares the measured value against an allowed min/max and then controlled the direction of the capsule movement by air jets to sorted bins. The unit operated at ten to twenty thousand reading per hour. Control system for Oxygen generator system for home use. 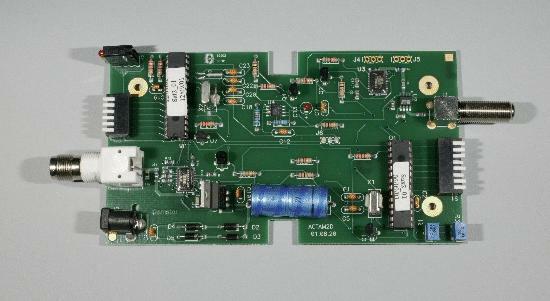 Agnew designed and manufactured thousands of these controllers for the client Medical Devices International of Toronto. The Oxygen generator uses molecular sieves to retain nitrogen, thus leaving oxygen enriched air mixture. We also developed and manufactured an optional oxygen level detector/alarm unit. The device measured the purity of the outputted oxygen by metering the acoustical prorogation rate in a sample tube. Increases in the density, (thus a increase in nitrogen) changes the timing and triggers the alarm. Investigation and feasibility studies into a number of products for Nor-Am Patient Care Products ltd. These include such items as pressure sensing blanket with alarm device to help prevent bed sores. Automatic test systems for various switch gear at Allen Bradley Ltd. in Cambridge Ont. We designed and constructed production line test units for motor starting switches, indicator lamps, push buttons, and selector switches. The various controller used AB supplied PLC controllers, custom fabricated mechanical fixtures using pneumatic activators. Tests included, Hi-Pot testing, trip current, contact resistant, selector switch profile measurement. The various unit has provision to connection to plant wide data network for statistical data gathering. Postal bar pre-marking system, which reads envelope's address and prints postal code fluorescent bars on outside per Canada Posts requirements. Edward Agnew was project engineer for this project done for Z-mark International of Toronto. The primary research and development work was funded by the National Research council of Canada. A number of patents have been granted for this product. The unit is composed of a number of microprocessor controlled stations which perform various task as the envelope moves alone a belt. These include reading the address through the envelope's window, controlling the printer system, and verification reader/rejection gate control. The unit is also designed to interact with the host mailing system to reduce speed or terminate operation if faults or excessive errors occur. The unit is being actively sold in both North America and Europe. Agnew constructed all prototype electronic units, and directed construction of mechanical components. Real time video effects control system for the Jazz system by ElectroHome, Kitchener. Agnew performed electronic design work for a part of the system. We designed the "Keyboard", which was composed of a 68000, 68HC11, PCMCIA ram card interface, joystick, graphic display screen, keypad and high speed digital control interface. The Keyboard allow the video editor to direct the video switching system. The unit records each command to the memory card, and then can replay command in real time during live video broadcasts. Bar Code (UPC) reader/verifier system for American Bar Code Systems. This multiply processor unit has a main control processor with provide keypad/display interface. In addition, there are three sub processors, each connected to bar code readers. Special effects lighting controller and driver system for providing animated lighting sequences for electronic equipment being used for movie props. The system can provide an number of sequences at various rates including external voltage control. Automatic clothing dryer control to terminate cycle when dry, based on input power only, Developed for Watershed Energy Systems Corp, Toronto, funded by Ontario Hydro and Ont. Ministry of Energy. ( Patent pending) The unit has a current transducer which permits the onboard microprocessor to determine and monitor the operation of the heating elements within the dryer. Based on the fact that more energy is required to maintain fixed air temperature while the clothes are giving up moisture, than when dry, the unit can detect when total dryness has occurred. However the task is a bit more complicated to permit detection of when the desired 4% moisture level point is reached. By using curve fitting and predictive algorithms, the software determine this point in time and terminates the drying cycle by opening a set of relay contacts removing power to dryer. Controller system for Air Capsule solar energy capture system. For Watershed Energy Systems Corp, Toronto. The control monitors entry and exit air temperatures for a air based solar collector system. The computer then modulates the speed at which air moves through the collector system. It also estimates the approximate energy based on Temp times air flow rate. An automatic ceiling fan control system using a carrier current radio linked system for Robinson Controls of Windsor. An enhancement to Robinson's patented control system, by replacing hard wired control system with wireless. The system automatically controls ceiling fans throughout a building in response to operation of the heating/cooling system. Advanced Lamp dimming system for HID lighting system. The system developed for AGEX uses 4 microprocessors to control 3 dimming units in a master/slave system, where each slave is capable of driving 20 to 60 Amps of load at up to 477 volts. The system constantly monitors the power factor of the load and insures lamps remain operational during dimming. Development of various Micro-processor, digital logic and analog training devices. For Sheridan College, and Mens Technical College in the UAE. These courses target such microprocessors as 8088, 6902 and 6809. Writing of various course material for digital and analog training courses, Sheridan college and Spar Aero Space. We have provided technical consulting services of general nature on a number of projects to this organization. We are recognized by the NRC as a research and development corporation and have successfully completed a number of NRC funded projects.